In order to model the core repressilator system and its attached signal transduction pathways, we utilised a stochastic agent- and rule-based language called Kappa. Figure 1: Three Kappa agents, representing DNA, bound together at their respective upstream and downstream sites. In Kappa, biological entities such as proteins, DNA, and RNA are represented as agents, which are essentially named sets of sites that can be used to hold state or bind and interact with other agents. The example shown in Figure 1 shows how a promoter BioBrick can be represented within Kappa – as a three-agent-long piece of DNA, connected via upstream and downstream sites, with binding sites for transcription factors and RNA polymerase, and a type site to keep track of its Registry code. Figure 2: A Kappa rule representing the binding of a repressor protein to the promoter region of a DNA. Interactions are represented by rules in the form of precondition and effect, with an associated rate of reaction that governs how frequently the interaction occurs. The example shown in Figure 2 describes a repressor binding to an open binding site upon a promoter; note the preconditions that both promoter and repressor binding sites must be empty beforehand, and the effect that they are now bound together. In this case, the reaction is reversible; that is, there are both forward and backward reaction rates associated with binding and dissociation of the repressor upon the promoter. By combining agents with an appropriate set of rules and rates, a Kappa model can be used to simulate systems of varying complexity, from a simple MAPK cascade to the oscillating rhythm of a circadian clock. Figure 3: A Kappa simulation of a repressilator, with red luciferase protein repressed by the presence of lacI. Units (time and concentration) are arbitrary. 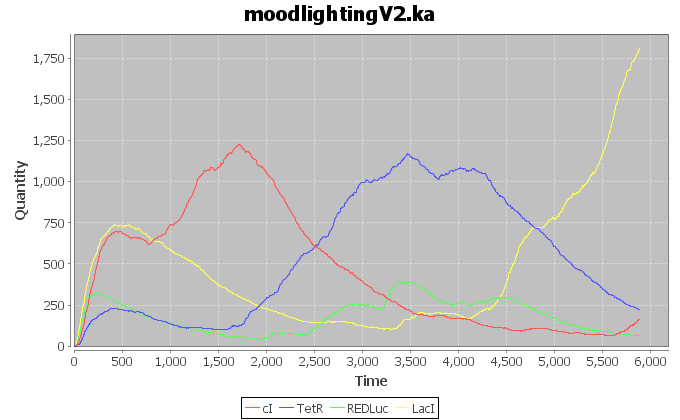 The results of the simulation shown in Figure 3 track the discrete counts of lambda-cI (red), TetR (blue), and LacI (yellow) in a slightly modified version of the Elowitz repressilator, for one particular stochastic trajectory (obviously, different runs of the simulation will generate different results, some more variable than others). The modification made was the addition of a red luciferase BioBrick linked to a lacI promoter; high amounts of lacI repress the production of the red luciferase, but as soon as the concentration of lacI falls, the amount of red luciferase in the system rises, as expected. Agent- and rule-based modelling allows for the circumvention of one of the primary problems with biological modelling: the fact that molecular entities existing under different conditions (phosphorylation, states of activation, etc.) can result in quantitative combinatorial explosion that greatly complicates traditional modelling methods such as differential equations. Kappa models can be unambiguously reduced to their ODE counterparts, but to do so would likely result in a system too large and too complicated to understand or create from scratch, as each rule in Kappa would equate to a potentially massive number of reactions in an ODE model. Throughout this wiki there are words in bold that indicate a relevance to human aspects. It will become obvious that human aspects are a part of almost everything in iGEM.